Now that I'm reclaiming my Sundays (previously dominated by long half-marathon training runs and subsequent ouchiness), I feel like myself again. My heart's been a little broken since life has forced me to stay away from the kitchen. But I'm back, and so are my oven and my healed heart! 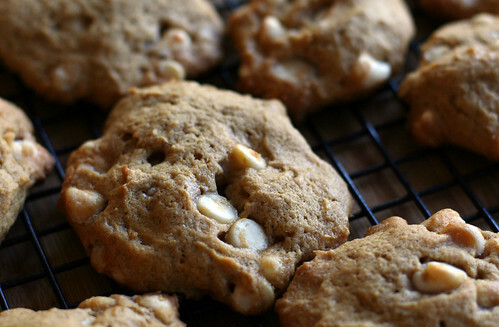 These Pumpkin White Chocolate Cookies taste like coziness. They have the warmth of pumpkin pie spice and the creaminess of pumpkin puree, with that lovable sweet shock that comes with any high dose of white chocolate. They're also on the soft, cakey side of the texture spectrum, which I love. The original recipe calls for a brown sugar frosting, but mine turned out sweet enough on their own so I skipped it. What are you baking this fall? 1. In a large bowl, cream butter and sugars until light and fluffy. Beat in the egg, vanilla and pumpkin. Combine dry ingredients; gradually add to the creamed mixture and mix well. Stir in white chocolate chips. 2. Drop by rounded teaspoonfuls 2 in. apart onto ungreased baking sheets. Bake at 350° for 12-14 minutes or until firm. Remove to wire racks to cool. Yum! 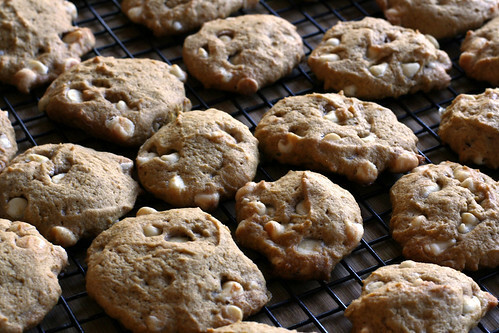 These look a lot like the cookies I baked on Friday, except I also included dried cherries. They were so tasty! I think I need to bake another batch this week. Glad to hear you're back in the kitchen! These sound really good (even to this girl who stays away from white chocolate) because of the way you described them... warm, spicy, creamy, and cozy... yes, please!